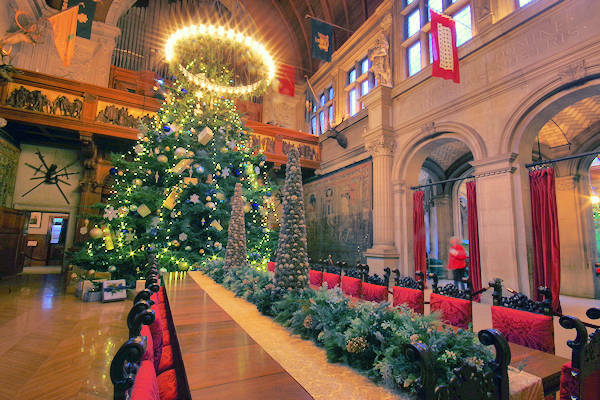 Enjoy our annual photo tour of the Biltmore House decorated for Christmas in 2018. Our favorite morning of the year is our preview tour early in the morning before opening. Note: Final touches were still underway since we took these on November 2nd. 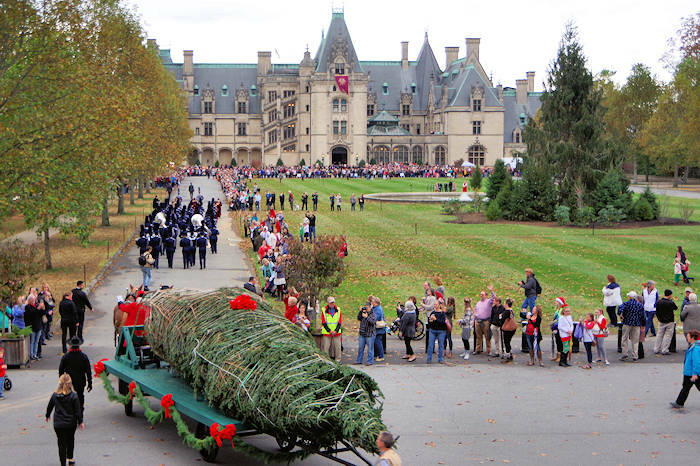 For info about this year's tours, go to our big Christmas at Biltmore 2018 Guide (tips, ticket specials, event details and more). 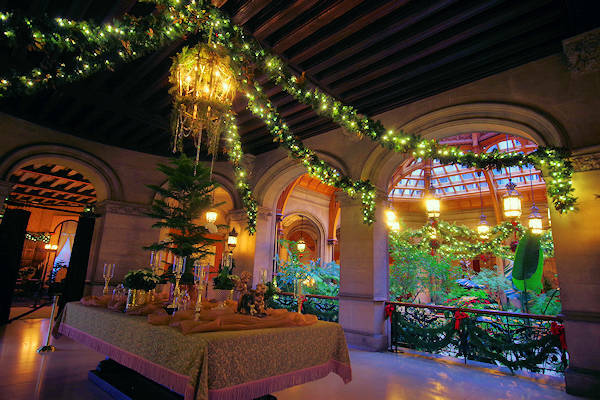 This is just a small sampling of what you will see - including 50+ trees, miles of garlands and hundreds of poinsettias. Each room is designed individually by super talented members of the Biltmore design staff. 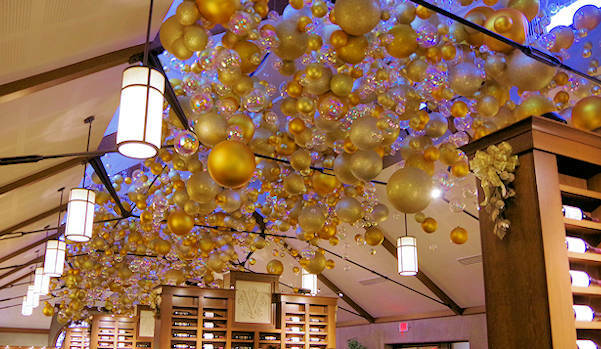 This year, find expanded decorations in other locations on the estate including Antler Hill Village and Winery. 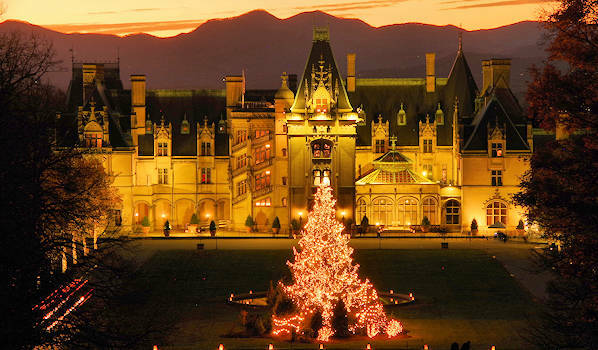 George Vanderbilt opened the doors of Biltmore House on Christmas Eve 1895. The family gathered in the Banquet Hall for dinner beneath a towering evergreen tree, decorated with 500 electric lights, ornaments and wrapped gifts (as it is this year). 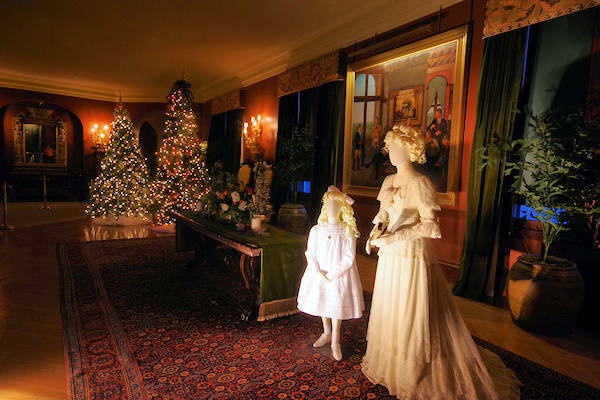 Edith Vanderbilt made lists of all employees' children (more than 100), and choosing special gifts for each of them. 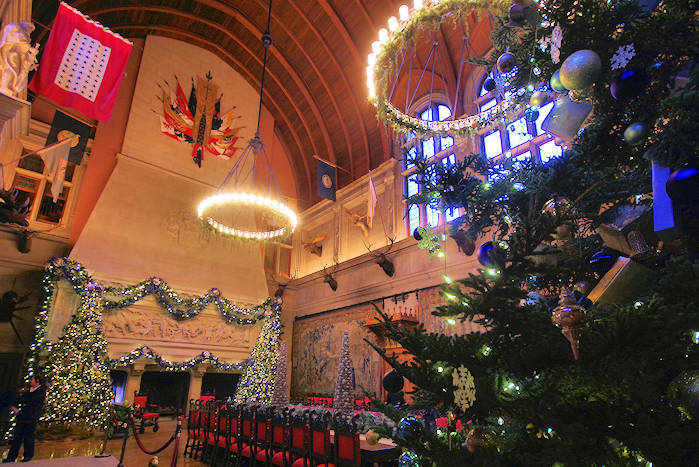 It takes a 37-foot live Christmas tree to command a presence in this towering 7-story tall room. 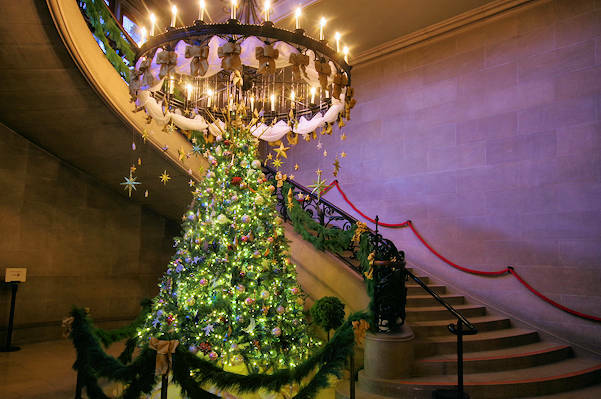 New this year, the first Christmas Tree that you see is wrapped by the grand staircase and "topped" by the massive 4-story chandelier. The celestial décor matches the Entry Hall. The Entry Hall decorations, along with the grand staircase, are inspired by the painting on the ceiling of the Library. We love the celestial feel, complete with stars and cherubs. The colors are soft blues, gold, pink and white iridescent. 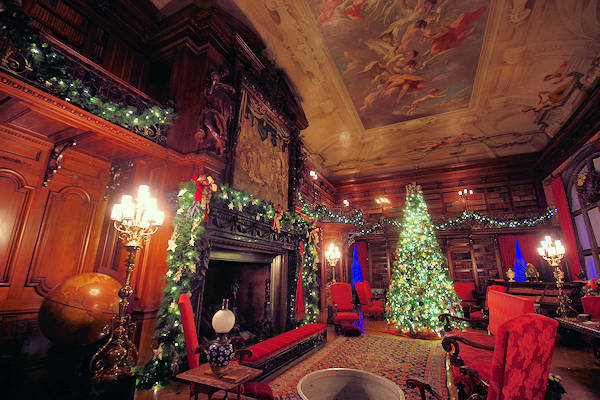 The Library is themed around George Vanderbilt’s love of travel as well as the adventures one can take in a book. The Second Floor Living Hall decorations with shades of greens and golds are inspired by the The Waltz painting by the fireplace. It was purchased by George at the Chicago World’s Fair and is one of the first paintings to ever depict electric light. See a little preview of the next clothing exhibition coming inside Biltmore House on February 8-May 27, 2019, A Vanderbilt House Party: The Gilded Age. Read all about it. 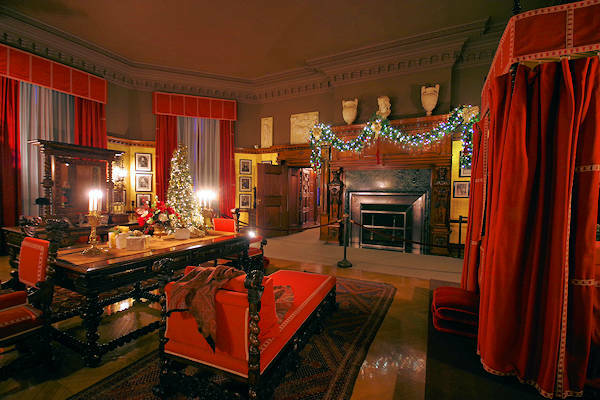 Mr. Vanderbilt's Bedroom red tones naturally has the Christmas feel - especially with decorations inspired by the alabaster carvings in the House. 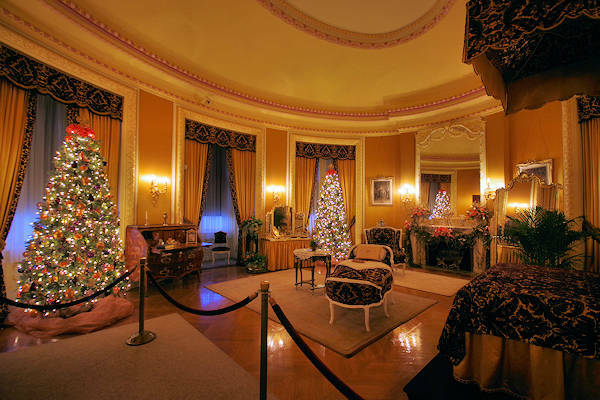 Look up as you walk through Mrs Vanderbilt's Bedroom. It is decorated in lush purple, amber and orange - inspired by the egg ceiling. The trees are inspired by the first Christmas that George and Edith spent together in Paris while they were courting. George’s friend Willie, stole one of his stockings and gave it to Edith who filled it with treats including the book “Quo Vadis”. As you walk through the house, be sure to notice the many and varied design elements. 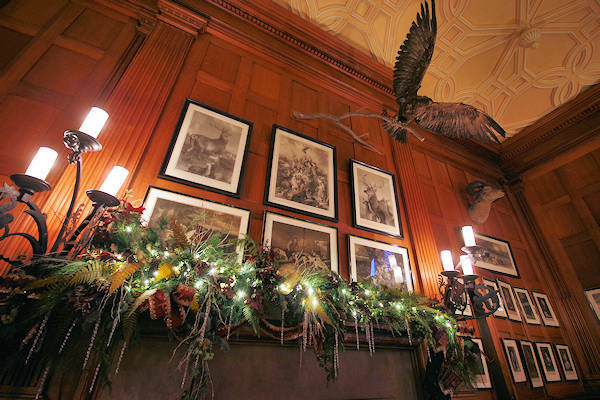 On the mantle in the Billiard Room, look for the dried hops and other local plantlife under the soaring Golden Eagle. 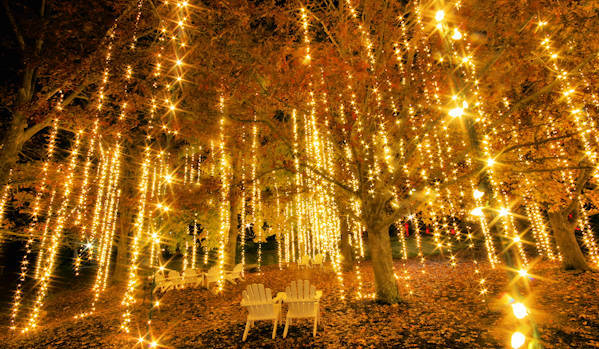 During the Candlelight Tours, the front lawn glows with a 55-ft. Norway spruce with 45,000 lights and luminaries. After you tour the house, don't forget to stop at the spectacular Conservatory by the Walled Garden. Stroll through the tropical paradise, complete with the towering poinsettia tree. Great for family photos! The 37-foot Christmas tree arrived with Santa to much fanfare on November 1, 2018. Read all about the tree raising, complete with photos and video. 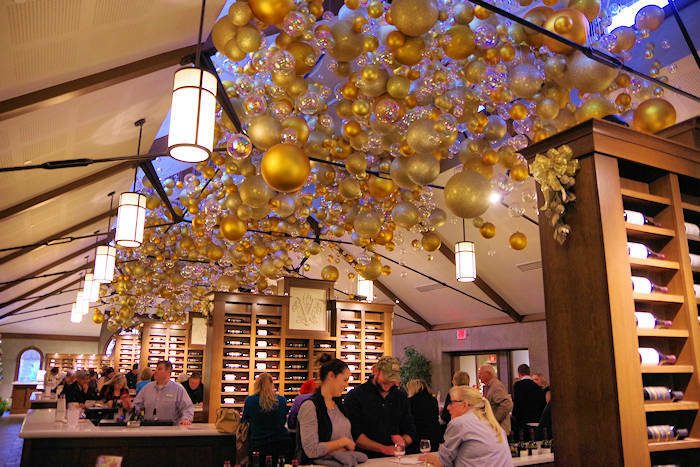 See the sparkling bubbles overhead in the Winery Tasting Room as you sample the Christmas wines (included in your admission). See much to do at the Winery. 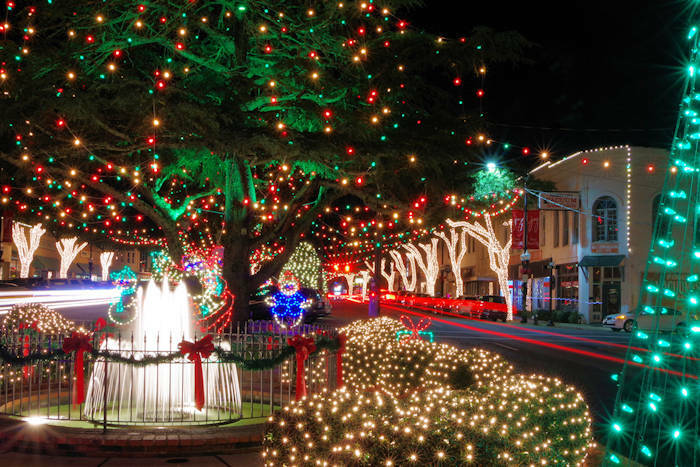 Antler Hill Village is decked out with many more lights. Stay on the Estate at their 4-star hotel with unparalleled service this Christmas season. Includes luxurious accommodations, Chef's Breakfast Buffet, gift, candlelight tour & daytime admission, audio guides, valet parking, estate shuttle service. Nov 2-Jan 5. Book early for best deals. 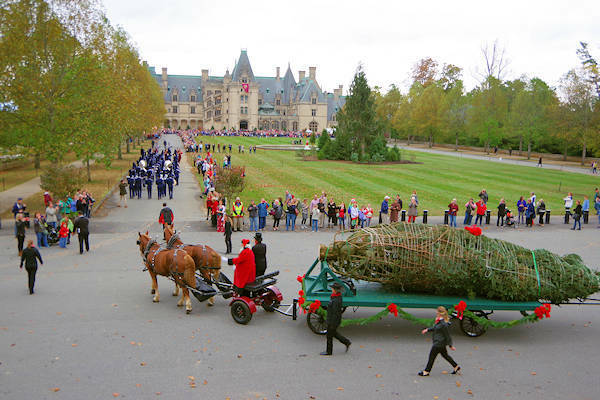 To plan a trip, see our Christmas at Biltmore Guide.